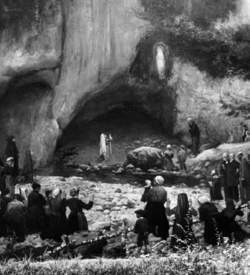 At the grotto of Massabielle in Lourdes, France, an audience gathers to see whether Marie-Bernarde Soubirous will see a vision of the Virgin Mary.Getty Images. Apparitions of the Virgin Mary rank with healing miracles as one of the most reported religious phenomena. Since the appearance of Mary to Sister Catherine Labouré in a convent in Paris in 1830, the event from which the modern era of apparitions is usually dated, literally thousands of people have claimed to have seen (and/or received messages from) the Virgin Mary. These have occurred overwhelmingly in a Roman Catholic context, but occasional accounts by Protestants and Eastern Orthodox believers have also surfaced. The most prominent apparitions, such as the ones at Lourdes, France, in 1854, and Fatima, Portugal, in 1917, have received the approbation of the highest authorities in the Catholic Church and have become the subject of an international movement within the church to respond to and promote the approved apparitions. Contributing to the interest in apparitions have been claimed appearances that have attracted much attention but have yet to be approved (although they have not been disapproved officially). Such apparitions would include those at Medjugorje, Bosnia-Herzegovina. The great majority of apparitions receive only local approval, if that. Some apparitions, especially a few of a spectacular nature that produce an immediate mass response among faithful Catholics, have been investigated and found to be wanting. In these cases, such as those that occurred for many years at Necedah, Wisconsin; Garabandal, Spain; and Bayside, New York (see Our Lady of the Roses, Mary Help of Mothers), have been officially disapproved. Both the Necedah and Bayside apparitions have become the focus of small schismatic movements. A number of apparitions of the Virgin Mary attained significance by initiating new forms of Catholic piety, such as the Rosary, or by becoming the source of national cults of the Virgin. Concepción, Virgin of Las Lajas, and Virgin (See, for example, entries on Nuestra Senora of Urkupiña.) However, a new era of apparitions de la Presentación, Virgen de la Purísima began in 1830 in Paris, this time against a back-drop of European skepticism that had begun undermining the role of the church in public life and would lead to the separation of the church from an official place in government hierarchies. The most dramatic changes would come in Italy, where the pope would be shorn of the territory over which he ruled as Italy became a modern secular state. The apparitions of the Virgin throughout the nineteenth and twentieth centuries have been the foundation upon which a whole new emphasis on the role of the Virgin has been defined in the church. Mary became the subject of two proclamations that swelled the content of Catholic dogma (teachings necessary for the faithful to believe): In 1854 the doctrine of the Immaculate Conception (that Mary, like Jesus, was born without original sin) and in 1950 the doctrine of the Assumption of the Virgin (that Mary did not die but was taken directly into heaven at the end of her earthly existence) were proclaimed dogmas. In between these two events, the pope was declared to speak infallibly when acting as Pope Pius XII did in 1950 when he defined the new dogma. It has been noted that in recent years, popes often assert their power within the church through statements on the Virgin Mary. The approval of the Catholic Church of any particular apparition is a complicated process. After such an apparition occurs and people begin to respond to the occurrence and the messages received by those who see the Virgin, the local bishop may launch an investigation. In cases where there is no obvious fraud or teaching that is against orthodox faith, he may grant initial approval, which carries with it an encouragement for the piety that has emerged around the apparition. He may then move forward and offer an opinion on the supernatural element of the apparition. At this second level, investigation must rule out as sources of the apparition some problem with the visionaries, fraud, natural phenomenon, or demonic activity. Once the local bishop has offered an opinion, the case may be moved to a higher authority, most often the national council of bishops for the country, to a curial office in Rome, or even to the desk of the pope. Recent popes have played a dramatic role in approving various Marian apparitions by their statements, visits to the sites, and, as in the case of Fatima, canonization of the visionaries. Once the bishop or higher authorities have ruled, two possibilities arise. First, the church may issue a negative ruling relative to a particular apparition. In that case, the faithful are not to believe in it nor participate in activities at the site. To the contrary, a positive ruling does notdemand acceptance of the apparition. However, in that case, believers are asked to refrain from berating the messages received and the apparition. In the great majority of cases, devotional activity around an apparition remains purely a local matter, and the bishop chooses not to make any ruling. Such is the status of approximately 300 of the nearly 400 apparitions that have been reported in the twentieth century. Scholars attempting to make sense of the Marian apparitions have approached them at many levels, and some important work has been done by historians and social scientists who have noted corollaries between the apparitions and significant social events. Those investigating the different apparitions have been careful in searching out mundane causations and cautious to report on events about which significant elements of doubt remain. Skeptics have been much more reticent to denounce the apparitions, at least those that have received support after investigations by the church, partly due to an insufficient number of researchers necessary to conduct the time-consuming and complex independent investigations. Thus, in large part, one is left with the opinions expressed by church authorities on the authenticity of such phenomena. Those who believe in the apparitions have tended to take the messages spoken by Mary quite seriously. In most cases these messages have encouraged various forms of Catholic piety and an increase in the amount of time devoted to them. However, running through the messages have been a variety of dire predictions of an apocalyptic nature, warning the faithful about a fast-approaching end of the world. Students of the apparitions have attempted to correlate the messages of the different events to derive some comprehensive understanding of what they feel is the message that the Divine is attempting to communicate to humankind at this particular moment. Breen, Stephen. Recent Apparitions of the Blessed VirginMary. New York: Scapular Press, 1952. Durham, Michael S. Miracles of Mary: Apparitions, Legends, and Miraculous Works of the Blessed Virgin Mary. San Francisco, CA: Harper, 1995. Heintz, Peter. A Guide to Apparitions of Our Blessed Virgin Mary. Sacramento: Gabriel Press, 1995. “The Mary Page (University of Dayton).” Posted at http://www.udayton.edu/mary/marypage21.html. Accessed April 1, 2007. Zimdars-Swartz, Sandra. Encountering Mary: From La Salette to Medjugorje. Princeton, NJ: Princeton University Press, 1991. The many similarities and the spiritual bond between the pope and the president--and how Reagan privately spoke of the "DP": the Divine Plan to take down communism; New details about how the Protestant Reagan became intensely interested in the "secrets of Fatima," which date to the reported apparitions of the Virgin Mary at Fatima, Portugal, starting on May 13, 1917 (sixty-four years to the day before John Paul II was shot); as well as a startling insider account of how the USSR may have been set to invade the pope's native Poland in March 1981--only to pull back when news broke that Reagan had been shot. The late President's favorite rosaries was one that came from Sister Lucia, one of the children who witnessed the series of apparitions of the Virgin Mary in 1917 near the town of Fatima in Portugal. It was here that a 14-year-old local girl experienced 18 apparitions of the Virgin Mary in the mid-19th century. The stories about apparitions of the Virgin Mary to particular ethnic groups or cultures who have claimed her as patron are as varied as the languages of the world. APPARITIONS of the Virgin Mary are just people's eyes playing tricks on them, a scientific expert has claimed. Apparitions of the Virgin Mary, which go back at least to the third century, "are viewed by those who believe in them as both a promise of salvation and a prelude to apocalypse. Furthermore, the first Bishop of Mexico was a Franciscan priest, Juan de Zumarraga (1528), who was the Bishop of City Mexico City during the Apparitions of the Virgin Mary which took place three years after his Bishopric began. The water has powers that many Roman Catholics ascribe to the Lourdes spring, where apparitions of the Virgin Mary first appeared in 1858. Blessed: A Quest For Atlantis In Egypt Leads To Apparitions Of The Virgin Mary by Carole Chapman is the inherently fascinating story one woman's exploration of the Egyptian landscape in attempt to confirm her memories of Atlantis but resulted instead with the unexpected but quite remarkable vision of the Virgin Mary, Blessed offers readers an assurance of the Virgin Mary's powerful ability to bring about peace, as well as touching upon the Copts (who are direct descendants of the ancient Egyptians who were converted to Christianity in the first decades after the death and resurrection of the Christ), as well as the significance of certain artifacts left by ancient Mayans and paintings in the Pharaoh's tombs. PS I note with the sort of objectivity expected of journalists, that some so called quality newspapers carrying obituaries of Sister Lucia De Jesus Dos Santos, 97, the last of the three children said to have seen apparitions of the Virgin Mary outside the Portuguese town of Fatima in 1917, reported the events as indisputable fact rather than supposition. The most noteworthy exceptions are Paolo Apolito's consideration found in his book dealing with the apparitions of the Virgin Mary at Oliveto Citra, Italy and Daniel Wojcik's article found in the 1996 issue of the Journal of American Folklore.